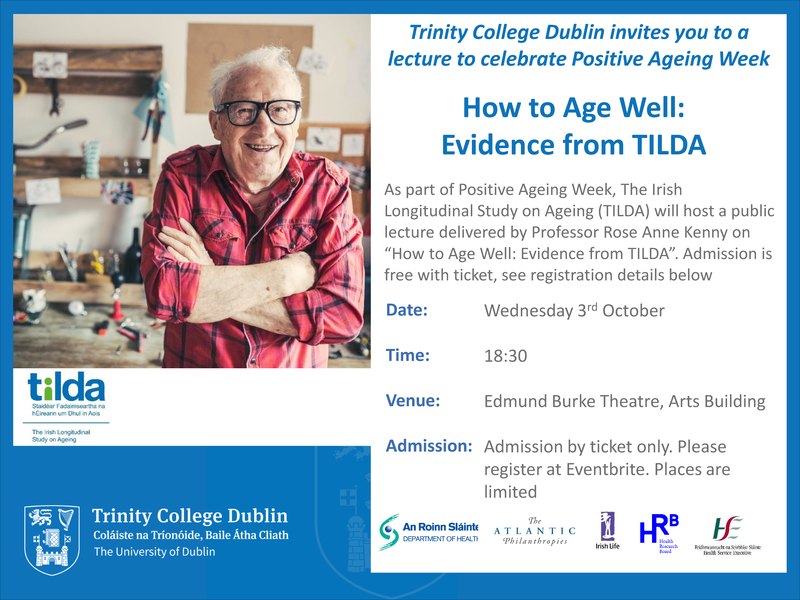 As part of Positive Ageing Week, Professor Rose Anne Kenny, TILDA founder and Principal Investigator will deliver a free public lecture, “How to Age Well: Evidence from TILDA” to present findings from over 10 years of TILDA research on the ageing process and highlight the incredible contribution of over 8,500 participants to ageing research and to Irish society. Professor Kenny will explore the ageing process itself, why we are living longer and look at how TILDA research is helping us to understand how to age well; ensuring that the extra years of life gained from increased longevity are spent in good health and wellbeing. The lecture will highlight TILDA’s cutting edge research findings on prevention of chronic disorders, how to keep active and physically well, maintaining brain health and function into older age, and protecting and maintaining mental health, wellbeing and quality of life. Professor Kenny will address the everyday challenge of ageism, and how this needs to be countered to prevent marginalising older citizens. She will also discuss the influence of TILDA’s research on a wide range of government decisions which affect older adults, healthcare practice in Irish hospitals and GP surgeries and public awareness. The lecture will help to empower individuals to better understand the ageing process and manage individual quality of life and health and wellbeing.